This is a continuation on the topic I started discussing in Lancaster’s Galatians: Introduction, Audience, and What Happened to the Torah? and continued in Broad Strokes. I asked the first of these four questions in Part 1 of this series (please read it if you haven’t yet) but quickly discovered that I’d never get all four questions and their answers in a single blog post. Hence, Part 2 presents the second question. Hopefully, the answer will be illuminating. Why Did Many Jewish People Reject Paul and the Message of the Messiah? Let’s face it. Paul received a tremendous amount of opposition during his journeys as he spoke of Christ, not only from the Greeks and Romans, but from many individual Jews and Jewish communities as well. This is exquisitely documented in Luke’s Book of Acts and often gives support to the traditional Christian doctrine that the Jews rejected Jesus but the Gentiles accepted him, thus Jews are now universally without salvation and a place in Heaven, and the Gentile Christians have inherited all of the covenant promises that once belonged to the Jews, replacing them as God’s chosen, splendourous people. Did the Jews reject Jesus? We’ve already seen in Part 1 of this series (link above) that not all of them did and actually, thousands upon thousands of Jews completely accepted the Christ and were devoted disciples of the Messiah. In fact, in one of my conversations with Pastor Randy, he said he believes that the Jewish population of “the Way” very likely outnumbered, and by a substantial amount, the population of any of the other sects of Judaism, most principally, the Pharisees. This is just conjecture on my part, but as Pastor Randy mentioned this, I couldn’t help but wonder if the Pharisaic sect as well as the Essenes, Sadducees and others, saw that their power bases would erode into eventual extinction should “the Way” take over the Jewish religious landscape by sheer weight of numbers in Jewish membership. We’ve also seen within the borders of ancient Israel that the apostles and disciples of Messiah were considered a threat to the corrupt and compromised Jewish religious leadership streams (particularly the Priesthood) that were firmly in the pocket of the occupying Romans. Herodian rule was also threatened for similar reasons. The Son of God accused them all of falsehood and usurping the rightful place of the valid Priests and Kings of Israel. These false rulers had every reason to want to silence a small but rapidly growing group who might one day soon incite the people to overthrow them. But that doesn’t explain the immense amount of resistance Paul experienced in the Jewish synagogues of the diaspora, who were outside the flow of those political currents. And he entered the synagogue and for three months spoke boldly, reasoning and persuading them about the kingdom of God. But when some became stubborn and continued in unbelief, speaking evil of the Way before the congregation, he withdrew from them and took the disciples with him, reasoning daily in the hall of Tyrannus. 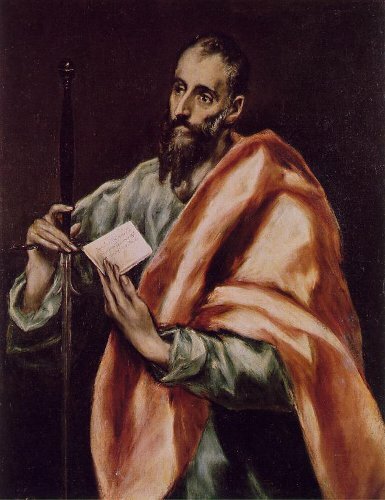 After three months, opposition to Paul’s message surfaced. It may have taken that long for the Jews of Ephesus to realize that Paul’s gospel invited Gentiles into the fold. This, I think, is the key to much (but not all) of the Jewish opposition to Paul and the Way. Besides announcing the salvation from sin and the life in the world to come promised through the Messiah, the number one thing that set Paul’s sect apart from all of the other Judaisms of that day was the inclusion of Gentiles as equal covenant members without the requirement that Gentiles undergo circumcision and convert to Judaism. This was unprecedented in ancient Judaism and in my opinion, the single largest stumbling block for Jews hearing the Messianic message of Paul and the other apostles. Remember the Jews of Pisidian Antioch who, in Acts 13:42-43 couldn’t get enough of Paul, Barnabas, and the message of Messiah, and begged them to return to their synagogue on the following Shabbat to speak more about the Kingdom and the Son of David? The next Sabbath almost the whole city gathered to hear the word of the Lord. But when the Jews saw the crowds, they were filled with jealousy and began to contradict what was spoken by Paul, reviling him. And Paul and Barnabas spoke out boldly, saying, “It was necessary that the word of God be spoken first to you. Since you thrust it aside and judge yourselves unworthy of eternal life, behold, we are turning to the Gentiles. This doesn’t mean, as we saw in Part 1 of this series, that Paul never again preached the good news to the Jews, but only on that occasion, when the Jewish leadership of the Pisidian Antioch synagogue spoke against him and reviled him. So what happened? On one Shabbat, the Jews couldn’t get enough of Paul and his teaching and exactly one week later, they can’t wait to shut him up and get rid of him. What changed? The Jews of Antioch were not jealous that Paul and Barnabas has such appeal or that their message was so popular. They were jealous that the message of the apostles compromised theological ethnocentrism. The message of the apostles seemed to throw the doors of Judaism wide open to the Gentile world. This is the “jealousy” to which Paul referred in his epistle to the Romans. I commented extensively in a previous meditation regarding this “jealousy” that the huge influx of Gentile God-fearers and pagans elicited from the Jewish synagogue leaders in Pisidian Antioch and you are invited to click the link above and read the full analysis of that event. Lancaster supports my understanding that the thing about the Way that summoned such a passionate and even hostile response from some Jewish communities was the unfettered admittance of non-Jews into what was once a wholly Jewish religious and community space. When the seven days were almost completed, the Jews from Asia, seeing him in the temple, stirred up the whole crowd and laid hands on him, crying out, “Men of Israel, help! This is the man who is teaching everyone everywhere against the people and the law and this place. Moreover, he even brought Greeks into the temple and has defiled this holy place.” For they had previously seen Trophimus the Ephesian with him in the city, and they supposed that Paul had brought him into the temple. Then all the city was stirred up, and the people ran together. 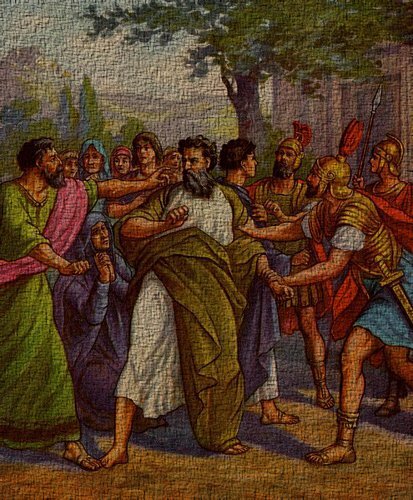 They seized Paul and dragged him out of the temple, and at once the gates were shut. And as they were seeking to kill him, word came to the tribune of the cohort that all Jerusalem was in confusion. Two major points must be considered here. The first is the fear and hostility elicited at the very thought that Paul would allow admission of a non-Jew into the Temple past the court of the Gentiles. After all, such a thing was not done. True, Paul hadn’t actually taken Trophimus into the Temple, but just seeing the two of them together inspired all sorts of terrifying fantasies in many of the Jerusalem Jews. The very thought of Gentiles having full and equal membership into a Jewish religious sect without first having to convert to Judaism and being compelled to obey the complete body of Torah mitzvot and halachah was unthinkable. For many Jews, access to the God of Israel was located in a “Jews-only” zone, which is understandable, given that Israel was a nation then occupied by a brutal Gentile army. Only the apostles and disciples of Jesus understood differently and even some of them would never completely reconcile themselves to Gentile admission. Here’s the second major speed bump. And when they heard it, they glorified God. And they said to him, “You see, brother, how many thousands there are among the Jews of those who have believed. They are all zealous for the law, and they have been told about you that you teach all the Jews who are among the Gentiles to forsake Moses, telling them not to circumcise their children or walk according to our customs. To the Jews in Jerusalem who were both devout disciples of Jesus the Messiah and zealous for the law, even the rumor that Paul was teaching the Jews in the diaspora, who were living among and worshiping with the Gentile God-fearing disciples, to forsake Moses, telling them not to circumcise their children or walk according to [their] customs was a horrible and virtually unthinkable idea. It was completely and totally against everything the Messianic Jews in the Land understood about the life and character of a devout Jew. Again, this rumor was completely untrue. Paul totally denied ever teaching such a thing to the Jews in the diaspora, so we can believe that Paul and the other devoted Jewish disciples of Messiah fully understood that there was no contradiction between their faith in Jesus and their lives as Torah-obedient Jews. The only thing that may have given the Jerusalem Jews the idea that Paul was teaching against the Torah to diaspora Jews is this. Thus all will know that there is nothing in what they have been told about you, but that you yourself also live in observance of the law. But as for the Gentiles who have believed, we have sent a letter with our judgment that they should abstain from what has been sacrificed to idols, and from blood, and from what has been strangled, and from sexual immorality. Apparently, there was some confusion about the instructions James and the Council of Apostles issued to the believing Gentiles (see Acts 15) involving the limits of their obligation to the Torah as opposed to what Paul was and wasn’t saying to his Jewish audience. If word got back how Paul was instructing the Gentile disciples within the context of the “Jerusalem Letter,” it may have been assumed that such was Paul’s general message to everyone he encountered, including diaspora Jews (for a more complete treatment of the Council’s ruling of “Gentile halachah,” see my six-part series on Lancaster’s Acts 15 commentary, Return to Jerusalem). I’m firmly convinced that among all the various reasons why individual Jews and Jewish communities rejected Paul’s message of Messiah, the number one “biggie” was the admission of unconverted Gentiles. Sadly, this was a problem that was never resolved and the cracks and fissures that developed between the Jewish Way and the rest of the Jewish sects eventually spawned a total split, ultimately resulting in a Gentile Christianity, and a stream of Judaisms moving forward in history that, by definition, were compelled to consider just about anyone a possible Messiah except Jesus Christ. Happily, there is a small but growing movement of Jewish people today who are rediscovering the Messiah Yeshua and who are devoted disciples of the Master within a completely Jewish worship, cultural, and lifestyle context. It is my belief that Messiah will continue to call the Jewish people who are his own back to him and back to the Gospel promise of personal salvation and national redemption of Israel. And the crazy thing is, once they gained a critical mass, the Gentile followers of the “Way” eventually became arguably the worst (certainly, the longest lasting) persecutors of the Jewish people since the birth of the Jewish nation. To this day, Judaism and the Jewish way of life is disdained, even by the more Israel-friendly Christians, with only remedy to the “Jewish problem” being full conversion to Christianity. So, in the Jewish eyes, it was very hard to accept then as is now that there was anything good in the “Good News” or that the Gentile conversion-free admission promoted by the early Jewish Christians was something positive (other than, of course, the fact that the outright Roman paganism gave way to Roman Imperial Christianity) . Except Gene, in Matthew 28:18-20, Messiah mandated making disciples of the nations and in Acts 15, James and the Council of Apostles (and it was good to the Holy Spirit, too) set out the specific parameters for the requirements of non-converted non-Jewish disciples of Messiah. So yes, for nearly the past 2,000 years, Gentile Christians haven’t been a good thing for Jews and Judaism, but since apparently God wants all people, Jews and well as Gentiles, to be reconciled to Him through Messiah, how is this to be done in a way that is beneficial to all populations? Your post made me consider the Temple during those beginning stages of gentile inclusion James. (Maybe Gene will weigh in too) but acknowledging the full and legitimate inclusion of gentiles (by faith in Messiah) to Israel…. yet, what about the specific requirements of Temple operation and access? Those laws weren’t able to be ignored, right? I’ve never thought about that aspect before but dang, is that the fuller reason the Temple was destroyed? yet, what about the specific requirements of Temple operation and access? Ruth, I’m covering the Temple in the fourth question, but I’m also borrowing extensively from a “meditation” I previously wrote on the topic so you can get an idea of what I’m thinking. I’m not trying to create a world where believing Gentiles are just Jews without circumcisions and I don’t presuppose that access to the Temple was or ever will be exactly equal between Jews and Gentiles, but history records that Gentiles were allowed to make certain sacrifices in the previous Temples, and even the Orthodox believe that Gentiles will be offering sacrifices again in the Third Temple. The fuller reason of the Temple being destroyed? I can’t say for certain, but one way of looking at it is that, for Messiah to be able to build the Temple upon his return, the older Temple built by Herod had to be destroyed first. This is the REAL reason why people (Jew or Gentile) reject the message that G-d sent into the world with his son Jesus, which was commanded be taken to the Gentiles. If a man digs for the truth, he will always find it in Jesus’ words. So, Steven, does this mean that one person who is currently an unbeliever can actually be “of G-d” and another person who is also currently an unbeliever is not “of G-d”, depending on their later acceptance or rejection of Jesus? Also, can an unbeliever in Jesus be “of G-d” before he actually believes? Considering that “all of Israel will be saved”, does this mean that there is a whole bunch of Jews today who are “of G-d”, even if they don’t know Jesus yet? Also, if a person at first rejects Jesus but then accepts Jesus later, does it mean that that person was not “of G-d” before and then became “of G-d”? Except when man’s ideas corrupt the words of Jesus. Just one thing about being or not being “of God.” Regardless of what we say we “believe,” it’s the kind of life we actually live that shows us who has turned their heart to God. Exactl! I would submit that there are Jews who do not believe in Jesus but demonstrate that they are “of G-d” by their lives and that there are those who claim to believe in Jesus, but demonstrate that they know neither G-d nor Jesus. (And of course, the opposite is also true). For, as A. James said, “even demons believe, and tremble”. Ultimately, it appears that G-d and His Messiah will judge humanity by what they did with their beliefs and not just what they believed. What you believe will ultimately result in your actions. Actually Steven, the whole point of Part 1 of this series is that lots and lots of Jewish people did hear his voice and follow him. So did lots of non-Jews. The result is that there always seemed to be a “mixed reaction” to Paul’s message from both Jews and Gentiles in the diaspora. Some accepted and some didn’t. So do not become proud, but fear. My whole point is that Yeshua told us why things are as they are and we do not have to wonder. This has nothing to do with branches boasting against one another…this later a human fault and not of the Holy Spirit. If you project this pride on me and characterize me as prideful does this proceed out of your own evil heart. “Actually Steven, the whole point of Part 1 of this series ” James, this is not part one…it’s part two. It is not “Paul’s message” it is G-d’s message and G-d spoke through Jesus and told us plainly why men reject his message. You don’t need to wonder why men reject the message of the Anointed One as send to us from above. Men do not reject the message of G-d because the Gentiles were entering an entirely Jewish space. They reject Jesus and the message of Jesus because they are not of G-d.
As for all those who did NOT reject him, it was because G-d drew them to the son and he gave them the power to believe unto life. “The Jews therefore murmured concerning him, because he said, I am the bread which came down out of heaven. I don’t think you’re quite getting me, Steven. I’m saying that there was nothing inherent in the Jewish population in Paul’s day that made them automatically reject Jesus, and there was nothing inherent in non-Jews that made them automatically accept Jesus. 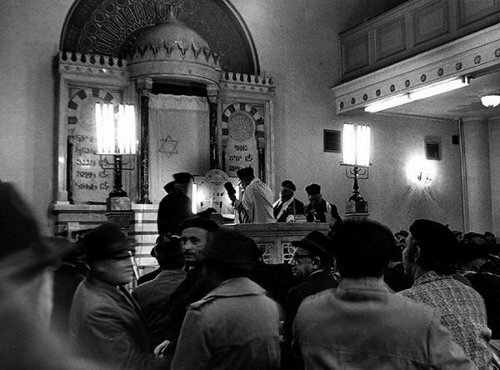 Both the Jewish and non-Jewish populations in the diaspora had a mixed response to the words of the Messiah. You can’t just say that Jews rejected Jesus because they were Jews. In quoting from Romans 11, I’m trying to introduce some perspective into what otherwise will be yet another debate of Classic Christian theology vs. what I actually read in the Bible, particularly in Acts. I also want to remind everyone that salvation through the Jewish Messiah isn’t the sole property of the non-Jewish people of the earth. It originated with the firstborn son of Israel, Messiah, Son of David. One expects the Messiah to go after the “lost sheep of Israel” which he definitely did. The miracle is that Messiah is God’s means to also redeem the people of the nations of the world. Neither you nor I need to be to pleased with ourselves that we are saved because it has nothing to do with any action we could take. If God will spare no effort, so to speak, to redeem we who used to not even be a people called by His Name, how much more will he send Messiah to the people he chose from Sinai? The story isn’t over yet. Be patient. I said that Jesus clearly said that those Jews who reject Jesus and the message G-d sent down from above do so because they are “not of G-d”, not due to Gentile inclusion into a wholly Jewish space. That would extend to those Gentiles who join unbelievers in rejecting Jesus and his words, they are “not of G-d”. Your right that our pleasure should be in G-d who saves, not in ourselves. ” O give thanks unto G-d; For he is good; For his lovingkindness endures for ever. I said that Jesus clearly said that those Jews who reject Jesus and the message G-d sent down from above do so because they are “not of G-d”, not due to Gentile inclusion into a wholly Jewish space. But let’s roll with that for a minute and see where it takes us. The Jewish synagogue members in Pisidian Antioch were all over Paul and Barnabas to tell them more about the Messiah. It was only when the next Shabbat came around and just tons and tons of Gentiles showed up that caused them to halt in their tracks. Luke doesn’t tell us exactly what they were thinking, but they must have had their desire to hear more of the Messiah overwhelmed by their sense of offense, not of Messiah, but of we Gentiles. In Acts 10, God had to give a vision of trief on a blanket to Peter to help him get past his learned revulsion of the Gentiles, so given that the Romans were making themselves a terrific pain to all Jews living within the empire, we can understand why many Jews would develop a lot of prejudice against Gentiles, even those in their midst. I’m not saying it was right and I’m not saying that they shouldn’t have seen past their prejudice (as Peter eventually learned to) and accepted God’s plan, but being human, they chose not to. One of the reasons I mentioned not boasting before is that *anyone* is capable of allowing their humanity to overwhelm their desire to draw closer to God. While the Jewish leadership at the synagogue in Pisidian Antioch should have done a better job, we can only blame them to the degree that we are blameless ourselves. If we have never, ever failed God, then we have something to brag about and can go around judging others who have failed God. However, we know we have also failed, so we should be willing to extend a little grace to those who are like us and have failed as well. Jesus doesn’t hate his lost sheep…he pities them and wants them to return to him. Those who hear his voice return…..those who do not hear his voice do not return. Jesus doesn’t hate people, people hate Jesus. Failed at what? Failed at keeping the Torah? Yes. Failed at hearing the voice of G-d and believing in the one sent down from above? No. The Jews at Antioch didn’t hate Jesus, they were overwhelmed and blinded by the “power surge” of pagan Gentiles crawling all over their synagogue. Failed at what? Please, Stephen. Don’t tell me you’ve never failed God at anything. You have no regrets? You can’t look back at your life and see even one occasion that you could have handled better…where you could have served God instead of failing Him? One could point to Peter denying Jesus 3 times and say he failed G-d. One could point to Saul persecuting the Christians and say he failed G-d. Any man can point to those things he did that failed G-d. I think you know that, so I’m not sure what you are getting at, other than another ploy to characterize me other than I am or to infer I am saying something I’m not saying. How do you know the Jews at Antioch didn’t hate Jesus? Did they hear the message of Jesus and return (repent) to G-d through believing in him? You’re supposing based on a couple of sentences that you know the REAL reason why Jews rejected the message of the Gospel. That is not the reason. The reason is explained by Jesus. I can’t help but think there is an underlying message here, perhaps some belief of yours that comes across in your writing. More specifically, an idea that it’s the Gentiles fault that Jews don’t believe in their own King and have some excuses for their rejection of salvation to Jew and Gentile through Christ alone. What did Peter and Paul NOT fail at? They heard the voice of G-d spoken by Jesus, they repented, they were baptized for the remission of sins, they received the gift of salvation and the very Spirit of G-d. I think you know there is a difference in types of failures and the difference in where the types of failures lead. Failure to hear G-d’s only son leads to death, the other types of failures upon repentance are forgiven and the Spirit leads to life. People are quick to judge the ancients. Imagine if your were a Christian today in some American Evangelical church, and some preacher comes to you and says that I am here to preach Messiah who has come to another country to visit the persecuted church there (say China), was executed on their death row as a criminal and supposedly resurrected (but whom I never met in person before and after death/resurrection, but who came to me in a vision and told me to tell you this). Oh, and I (the preacher) can do miracles to prove what I am saying is true – come to his healing services (broadcast on TBN, btw). “…the word of God be spoken first to you. Since you thrust it aside and judge yourselves”. I think it’s plain what was taking place and we don’t need to wonder or make excuses. When did G-d ever except excuses for not listening to his word? One could point to Peter denying Jesus 3 times and say he failed G-d. One could point to Saul persecuting the Christians and say he failed G-d. Any man can point to those things he did that failed G-d. Yes, they did and we should. It illustrates two things. The first is that men like Peter and Paul failed God and yet still were able to “make a comeback,” so to speak, and serve God in a very powerful way. It shows us that anyone can fail God and still be redeemed. God could have chosen to look at Peter or Paul and their failures as an absolute limit and condemn them both. As our righteous and final judge, that is certainly God’s right. And yet He allowed mercy and purpose to be predominant in His attitude toward these two Jewish men and not only His justice. Peter failed Jesus even after walking with him for years and being one of his closest apostles. Paul failed by allowing his zealousness to corrupt him and he needed to be literally blinded to finally understand how blind he had been about Messiah. May we begin listening to our Master before something worse happens to us. I know you’re capable of compassion. I’ve seen it on your own blog. But for some reason, you react to Jewish people as if they’re some sort of stumbling block for you. I guess we all have them. My reaction to Jewish people is hard love that includes refusing to water down G-d’s words so they can continue the path to destruction. Rather, it is better to stop coddling them and tip toeing around them because you are afraid to offend them. I know terrible things have come upon the Jewish people, all people really have suffered at times. If they bring these troubles on themselves, like the man who ate so much he could not move, or a nation or city that brings destruction upon themselves such as Sodom……it is better to not mince words and speak the truth. Repent or perish. If you were feeding the giant man, I would tell you to stop. You would say “look at how uncompassionate Steven is, can’t he see the poor man needs some sugar”? I would say “no, sugar is the last thing he needs”. Steven, I’d believe you if you treated everyone who does not accept Jesus in the same way, but you don’t. On the one hand, I suppose you could say that we must hold the Jewish people to a higher standard because of their special covenant status with God, but on the other hand, Christianity has been treating Jews especially bad for not receiving the Goyim Christ for the past 2,000 years. People, Jews or otherwise, aren’t just these little metaphysical puzzles to try to solve…they’re either the sheep of Christ or they’re not. None of us are born knowing Christ, even though the Jews are born into the Mosaic covenant and have sort of a “leg up.” There are all kinds of things that get in-between who we are and who God is, including our human natures, our personalities, our biases, our prejudices, and our tendencies. You should know this more than most. So the Jews at Pisidian Antioch had a lot of their prejudices against Gentiles get in-between them and the will of God to draw the goyim to Him. Peter had exactly the same problem, and if God hadn’t gone out of his way to convince Peter otherwise, Peter likely would never have gone to the house of Cornelius. He had to be convinced. The same goes for Paul. If he hadn’t encountered the Master and been blinded and subsequently undergone a lengthy period of study and isolation, I seriously doubt if Paul would have ever served Jesus. If you can apply the compassion you have for every other group of people who have reasons who hesitate in approaching Christ to the Jewish people as well, you will finally figure out what I mean. You might also want to re-read James 3 and consider the power of words. Even if words that hurt are truth, they don’t serve God. The ancient prophets of God were told to lay out harsh edicts and Paul when he spoke harshly was acting as Messiah’s special emissary. But you aren’t an ancient prophet and you aren’t Paul, and we “ordinary Christians” might do better to listen to James. I don’t want to have this conversation again and again. We’ve been down this road with each other too many times and I’ve got other things to do today. I’m closing comments in this one blog post effective immediately. I’ve said what I have to say to you on this matter Steven. Instead of crafting a response, look inward and see how you can apply what I’ve said to you.